Once you’ve built your own X-ray machine to take 2D images of the insides of stuff, there’s really only one logical next step: building your own computed tomography (CT) scanner to get 3D reconstructions instead. That’s exactly what [Fran Piernas] has done, and documented over on hackaday.io. While the original X-ray machine build dealt with scary hardware stuff such as high voltage and ionizing radiation, this time it’s the turn of scary mathematics like inverse radon transforms. The original build, which we wrote about in December, uses a commercial dental X-ray tube and a home-made 65 kV power supply to send X-rays through objects. Transmitted X-rays are viewed using an intensifying screen that converts the rays to visible light. The result is a 2D image similar to that we’re all familiar with. To create a 3D reconstruction of an object, you need a number of X-ray images taken from different angles. If you’ve ever been unlucky enough to need a medical CT scan, you’ll remember staying motionless in the tunnel while the X-ray apparatus rotated around you. In this build, [Fran] rotates the object instead, using a motor that may have once been part of a microwave oven (one of those “mystery motors” we all have laying around). The required sequence of images is simply obtained by recording video of the X-ray screen while the motor rotates the object. 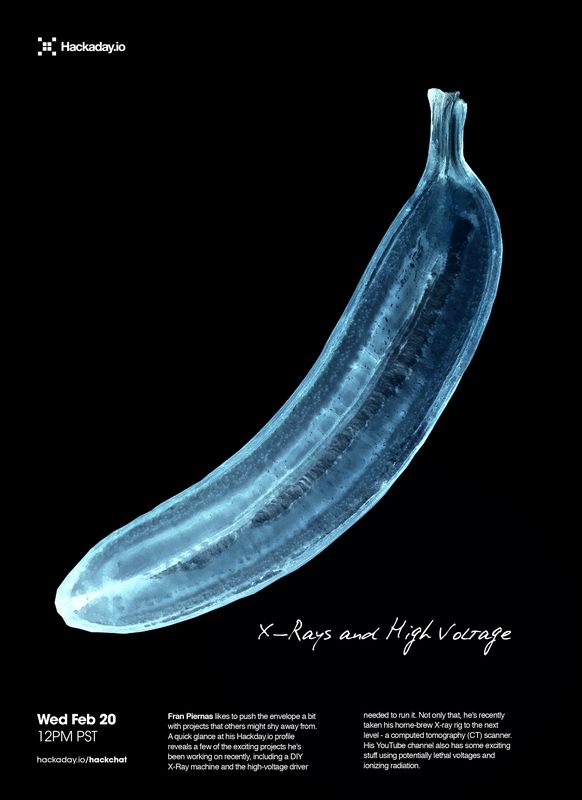 Join us on Wednesday at noon Pacific time for the X-rays and high-voltage Hack Chat! Fran Piernas likes to push the envelope a bit with projects that others might shy away from. A quick glance at his Hackaday.io profile reveals a few of the exciting projects he’s been working on recently, including a DIY X-ray machine and the high-voltage driver needed to run it. Not only that, he’s recently taken his home-brew X-ray rig to the next level – a computed tomography (CT) scanner. His YouTube channel also has some exciting stuff using potentially lethal voltages and ionizing radiation. What sort of experiments he has in mind for the future. You are, of course, encouraged to add your own questions to the discussion. You can do that by leaving a comment on the X-rays and high-voltage Hack Chat and we’ll put that in the queue for the Hack Chat discussion. Our Hack Chats are live community events on the Hackaday.io Hack Chat group messaging. This week we’ll be sitting down on Wednesday, February 20, at noon, Pacific time. If time zones have got you down, we have a handy time zone converter. If you’ve ever experienced the heartbreak of finding a seed in your supposedly seedless navel orange, you’ll be glad to hear that with a little work, you can protect yourself with an optical computed tomography scanner to peer inside that slice before popping it into your mouth. We have to admit to reading this one with a skeptical eye at first. It’s not that we doubt that a DIY CT scanner is possible; after all, we’ve seen examples at least a couple of times before. The prominent DSLR mounted to the scanning chamber betrays the use of visible light rather than X-rays in this scanner — but really, X-ray is just another wavelength of light. If you choose optically translucent test subjects, the principles are all the same. [Jbumstead]’s optical CT scanner is therefore limited to peeking inside things like slices of tomatoes or oranges to look at the internal structure, which it does with impressive resolution. This scanner also has a decided advantage over X-ray CT scanners in that it can image the outside of an object in the visible spectrum, which makes it a handy 3D-scanner in addition to its use in diagnosing Gummi Bear diseases. In either transmissive or reflective mode, the DSLR is fitted with a telecentric lens and has its shutter synchronized to the stepper-driven specimen stage. Scan images are sent to Matlab for reconstruction of CT scans or to Photoscan for 3D scans. The results are impressive, although it’s arguably more useful as a scanner. Looking to turn a 3D-scan into a 3D-print? Photogrammetry is where it’s at. Gray Eldritch has added a new project titled Humanoid Robotic hand Mk 2. Lex Kravitz has added Andrew Hardaway as a contributor to Feeding Experimentation Device 3 (FED3). Jan wrote a comment on OPEN Power (Prototype 1). Wayne Dahlberg liked Alpha V1: Open-Source Remote Controller. Carlos Quijano liked Open PCB Tesla coil. Frank Buss wrote a reply on Solar eLabel. Frank Buss wrote a comment on Solar eLabel.